This morning I pulled my bread machine off of the shelf, where it has been gathering dust since the last time I used it, which was … so long ago that I can’t even remember. Home made bread is so good and the bread machine is so low maintenance to use that it really makes no sense that I don’t make home baked loaves more often. I wanted to make a whole grain loaf today, however, I found that I was running low on the grains so instead I made a traditional farmhouse loaf – a nice, chewy type of white bread. As it was cooling on the wire rack around noon, I instantly wanted a slice for lunch. 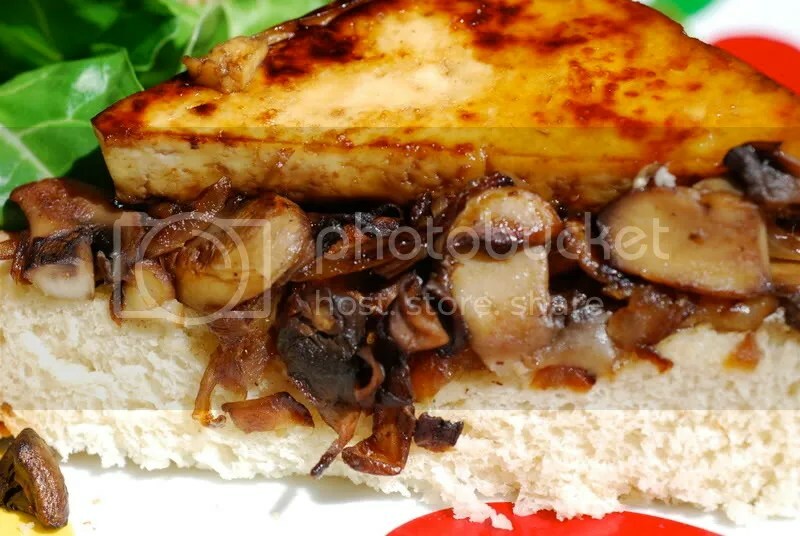 I was happily sauteing onions and mushrooms to pile on a slice of the bread when I looked at the pan and asked myself, “Where’s the protein?” That’s were the tofu came in. 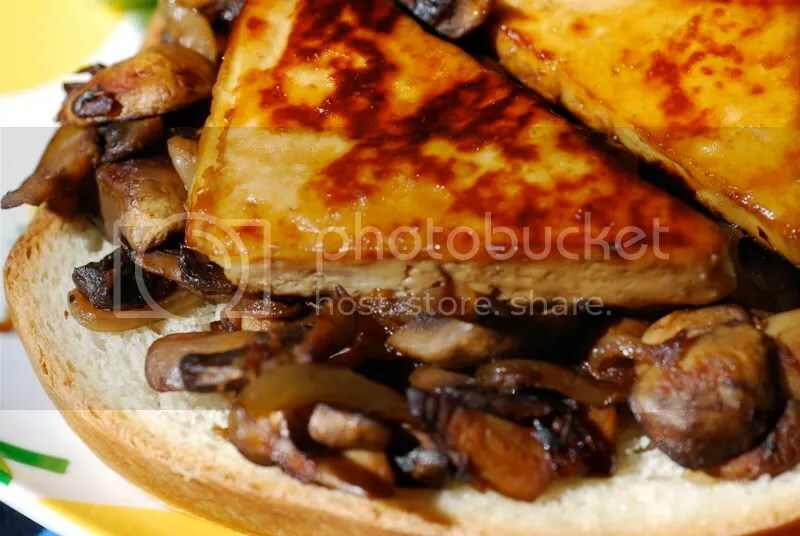 I usually prefer baked tofu on a sandwich but as I was already underway when I thought to add the ‘fu, I did a quick marinating session (about 15 minutes) and then cooked the tofu on the stove top (about 7-8 minutes per side over medium heat). I enjoyed my sandwich open-faced but Dan had his with the traditional two slices, both slices smeared with a touch of Earth Balance buttery spread. These sandwiches were exactly what I was after when I set out to whip up a rustic style lunch that utilized my home baked bread. 1. Heat the EB in a pan over medium-low heat and add the onions. Saute the onions for about 10-12 minutes, until they start to turn golden brown. Add the mushrooms and saute for another 10-15 minutes. Season with salt and pepper to taste. 2. Lightly spray a second pan with non-stick oil and cook up the marinated tofu (7-8 minutes per side, until browned). 3. 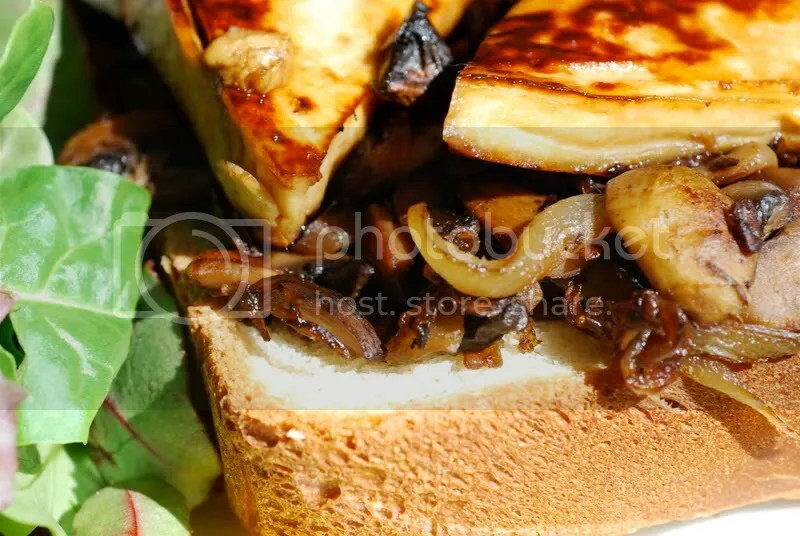 Pile a slice of bread with the onions and mushrooms, top with slices of tofu, serve as open-face or as a traditional sandwich. Enjoy!